Ghost Writer is a devised piece of theatre and dance by The Necessary Stage. 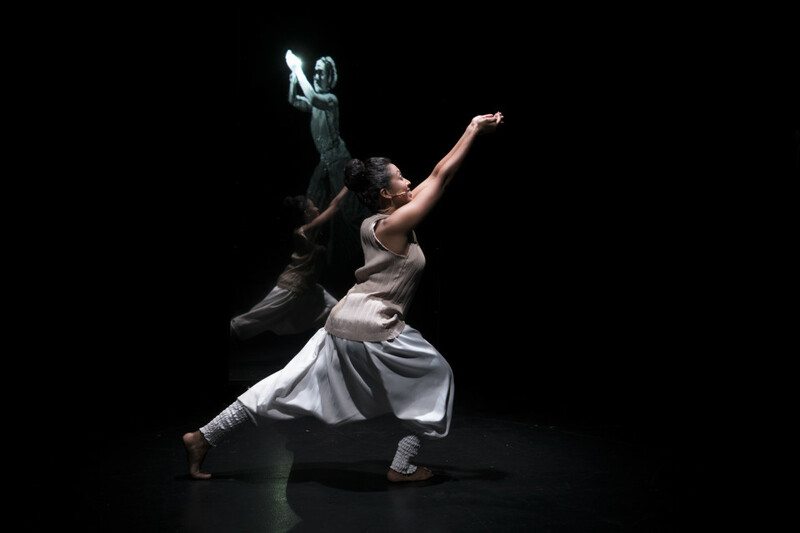 Directed by Alvin Tan, the performance brings peculiar stories into the main arena as well as to the framework of the piece – allowing overlaps of stories and emotions translated in dance, video, and music. The pains of an older dancer juxtaposed against an ageless digital dancer in the background. ‘ Let me dance for you, once again’ she said. In my opinion, the structure of Ghost Writer is very clear to the director and cast, however, it is not evident for the audience, which allows for the audience to immerse themselves in different aspects of this performance that talk about success, failure, and fantasy. The aspirations of a talented dancer are spoken about on stage, and at times illustrated through dance, however, I feel that the spoken word is stronger than the actual movement at this point thanks to playwright Haresh Sharma. The core of the narrative in Ghost Writer is spoiled with too many mediums. © Photos by Caleb Ming / SURROUND. Ghost Writer facilitates a performance of live music, projection, spoken word, and dance. At some points in the performance one of the mediums such as projection would be sufficient to portray an idea, however bringing all of these different elements together is the sort of curatorial work that requires patience, experimentation and time to allow the work to settle in. I believe that if Ghost Writer were to tour around the region it would be edited along the way into a more transparent framework. Ghost Writer strives through spoken word; the main medium used in this devised piece bringing to the foreground stories of sorrow and hope. The work of choreographer Ole Khamchanla upon the cast of performers is evident, however, at times the group work felt weaker simply because the cast is rich in a wide, diverse skill set, presenting a further challenge for the development of movement material that is accessible to everyone. The common denominator if you like is still text and not dance, however, the cast brings a beautiful sensibility to movement, it being a simple repetition of circular wrist motions or more elaborate dance phrases better developed by the choreographer himself or Jereh Leong. The dance element of this piece was very much connected to the entire performance. There is a feeling of belonging to the work from the performers, unlike some of the video material. The latter feels raw in comparison, still beautiful to watch, but I couldn’t help thinking if the projections are a work in itself, thus distant from Ghost Writer the theatre and dance performance. Ghost Writer by The Necessary Stage, performances at Esplanade Theatre Studio, 9th to 12th of June 2016. Osteopathy – choreographer gets injured drinking cider!